The all-free 16th Annual Berkeley World Music Festival celebrates song, music and dance from a wealth of cultures, Saturday & Sunday, June 1-2. Some of Bay Area's finest artists perform in various locations within the Telegraph Avenue neighborhood near UC Berkeley. Saturday & Sunday world artists converge on Telegraph Avenue in an exciting mix of street sideshows and cafe concerts, Noon – 8 pm. Simultaneously Amoeba Music’s concert in People’s Park and crafts fair is Saturday, Noon – 6 pm. 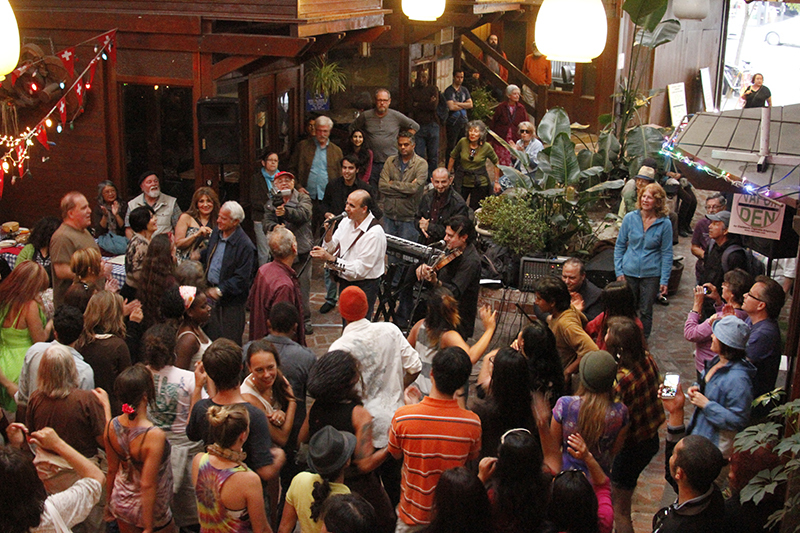 Saturday night Ashkenaz Music & Dance Community hosts an After-Festival party at 1317 San Pablo Avenue, near Gilman St.
On Sunday, the Festival joins "Sunday Streets Berkeley" on Telegraph. The “Ave” between Dwight Way and Bancroft Ave becomes a pedestrian plaza for folks to gather round community music groups and family fun activities. Not to be missed is the Festival’s Finale at the Tap Haus, 2516 Durant Ave.
Festival sponsors include Amoeba Music, Askhenaz Music & Dance Community Center, Berkeley Community Media, City of Berkeley, East Bay Express, East Bay Media, KPFA 94.1FM, La Peña Cultural Center, Sonic.net, Sunday Streets, Telegraph Business Improvement District and UC Berkeley. "While the music is global in scope, the artists are local, highlighting the wealth of talent, homegrown and adopted, that abides among us." "Music spills out from all corners of Berkeley during the annual Berkeley World Music Festival...It will feature a dazzling array of performances by some of the Bay Area’s finest artists." "Let’s celebrate what makes the Bay Area so unique: the fusion of music from all over the world." "A dazzling array of music - from Balkan harmonies, South American rhythms, Japanese flute, African marimba, Klezmer, and Zydeco." "A celebration of diverse local artists in an effort to promote local performers and provide a platform for artistic expression."